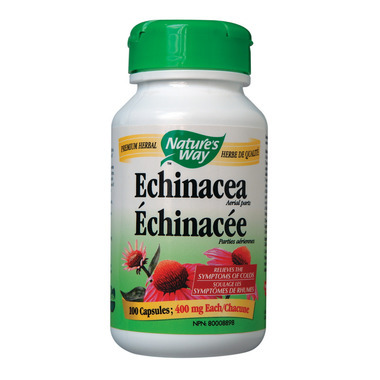 Echinacea has been clinically shown to support the immune system. Directions: Take at the first sign of cold or infection. Consult a health care practitioner for use beyond 8 weeks. Children 2-4 years: 1 capsule, 2 times daily. Children 5-9 years: 1 capsule, 3 times daily. Adolescents 10-14 years: 2 capsules, 3 times daily. Adults: 14+: 3 capsules, 4 times daily. Other Ingredients: Gelatin (capsule), silica. Warning: Consult a health care practitioner if symptoms persist or worsen, or before use if you have a progressive systemic disease such as tuberculosis, leucosis, collagenosis or multiple sclerosis, or if you are using immunosuppressants. Contra-Indications: Do not use if you are allergic to plants of the Asteraceae / Compositae / Daisy family. Known Adverse Reactions: In case of hypersensitivity, discontinue use. The Natures Way Enchinacea gives my family the extra support for our immune system we need to fight off colds, flues and infections quicker. When we are feeling colds coming or symptoms of flu this product works great. Highly recommended. A winter essential to fight off colds as soon as they appear. A must to have on hand.